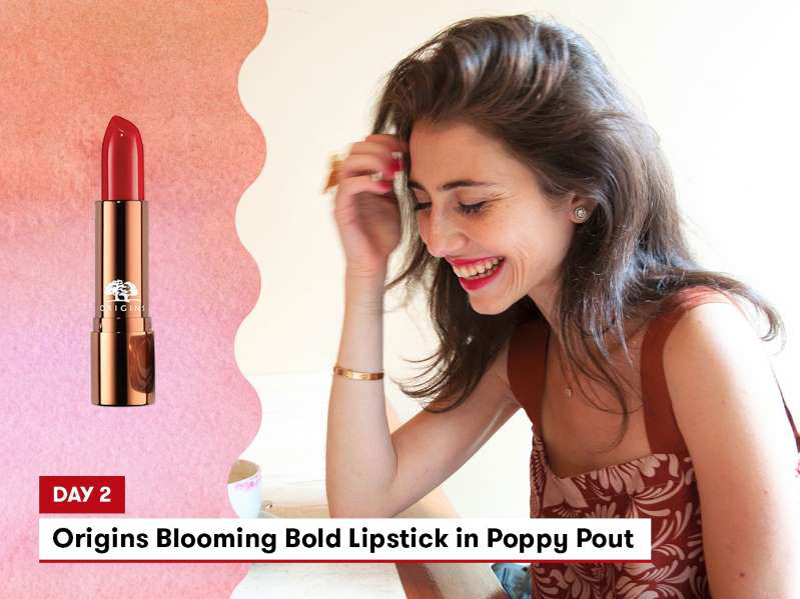 Throughout my lipstick-wearing life, I’ve erred on the side of caution when it comes to shades—soft pinks and those demure nudes that, although they can be quite elegant, hardly turn heads. 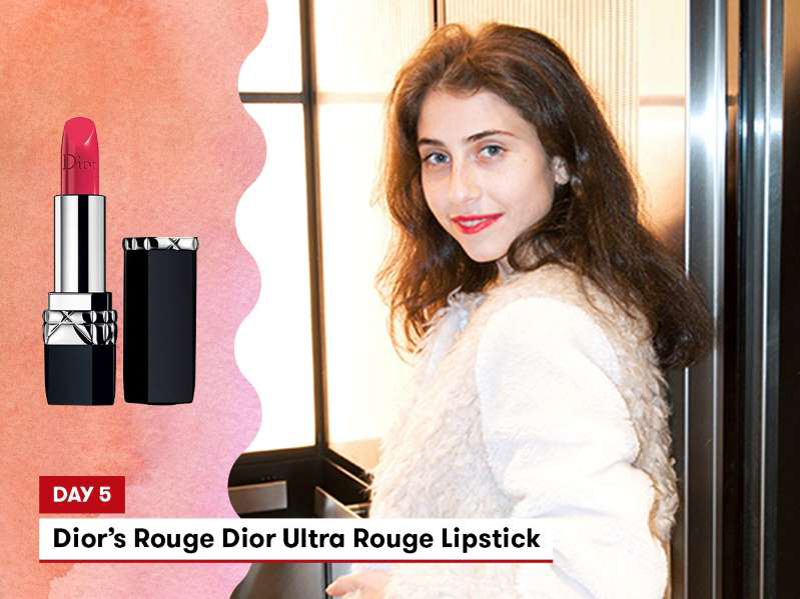 Red lipstick has always made feel extremely self-conscious, like a life-size caricature. It’s also daunting to apply and exhausting to touch up throughout the day, so I avoided wearing it. I’ve admired women who could wear a red lip during the day and appear entirely unperturbed—they seem so vibrant, so chic, and so daring. Who are these bold creatures and why couldn’t I be one of them? It became clear to me about a month ago that the only person holding me back was myself, so in an effort to overcome these inhibitions I decided to commit to a weeklong challenge of wearing red lipstick all day, every day. I also reached out to a makeup artist for advice—if I was going to do this, I was going to do this right. Ahead, read about all the practical and personal things I learned along the way. 1. 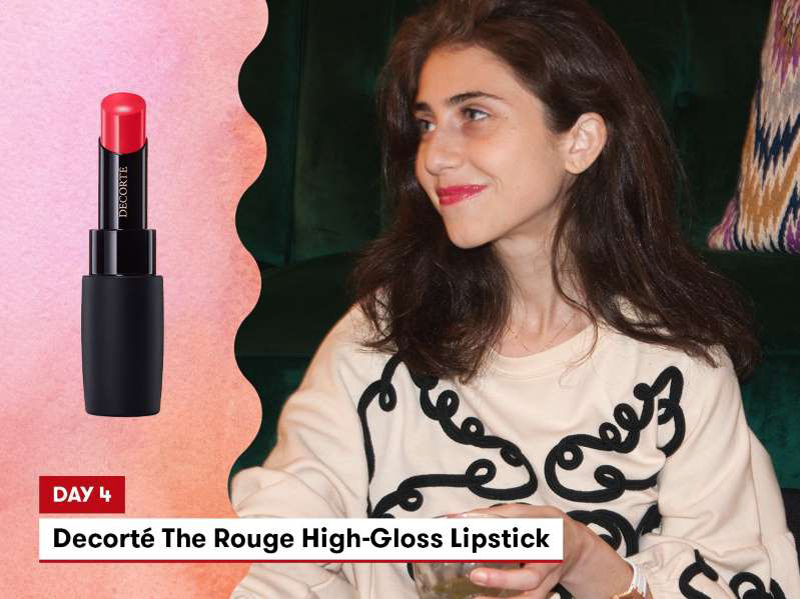 There are so many ways to wear a red lip. © Photographer: Cristina Cianci, Graphics: Morgan Johnson Buy it: Avene’s Cold Cream Lip Butter, $16, and CYO’s Two Clever By Half Lipstick & Liner, $6. 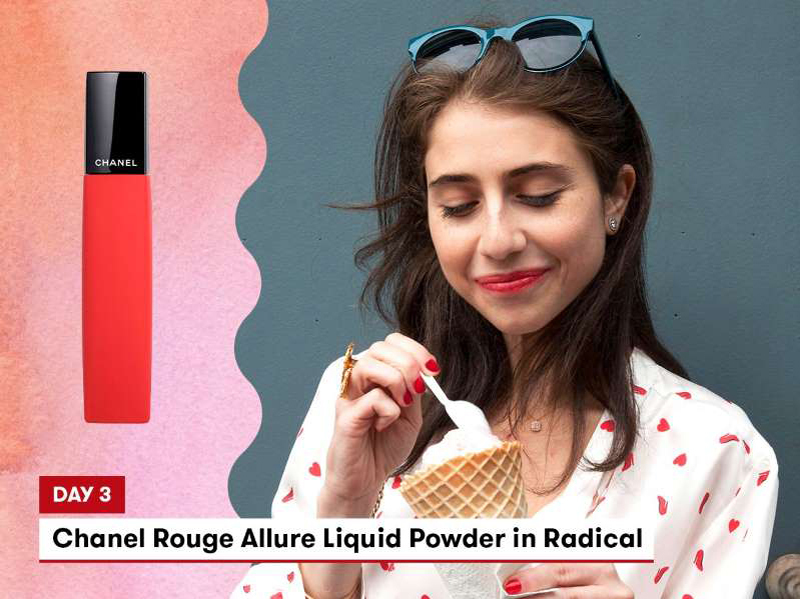 A red lip can mean so many things, from a high gloss to a matte finish to sheer tints and stains that are hydrating minus the whole hair-stuck-to-your-lips thing. I enjoyed playing around with new formulas and textures, including my new favorite, a liquid powder. 2. Lip balm is essential if you want smooth lips and to prevent the color from bleeding. Have you ever noticed your lipstick bleeding around the contours of your lips? Makeup artist and beauty expert at Stila Cosmetics Carly Giglio tells SELF this usually happens when you have dry lips, so it’s important to keep them hydrated. To keep my lips smooth and hydrated, I applied a lip butter before lining my lips the first time, but apparently it was too much, because it made the lining process slippery and sloppy. To avoid this, Giglio recommends a lip-prep product that’s not super emollient. She likes the Fresh Sugar Lip Serum Advanced Therapy, $36, because it’s hydrating without a heavy texture. Another pro tip: If you get excited applying a lot of lip balm like I did, you can always let it set in for several minutes before applying lipstick. I decided to blot it out with a clean tissue since I live in Manhattan where patience is an indulgence I can’t always afford. 3. If your lips feel particularly rough, start your lip prep with a scrub. Giglio recommends using a clean spoolie to gently exfoliate and scrub off any dry bits on your lips before starting in with your lip balm or lipstick (resist the urge to peel or bite off peeling skin, which can be painful and lead to bleeding). I only used a lip scrub once this week. I like the Laneige Lip Sleeping Mask, $20, for an overnight treatment and Kopari’s Kiss Me Under the Mistletoe, $20, which is a coconut lip scrub and balm duo. I scrubbed my lips with the Kopari scrub in the morning and applied the balm quickly after. I love the smell, it’s like coconut slivers dipped in fresh caramel. Is it bad I wanted to lick it off? 4. Use concealer around the outside of your lips to define their shape. © Photographer: Cristina Cianci, Graphics: Morgan Johnson Buy it: Undone Beauty Moisturizing Sheer Balm Tint in Clear, $5, and Origins Blooming Bold Lipstick in Poppy Pout, $20. To create a defined lip line, Giglio suggests going around the outside of your lips with foundation. You can use your finger to swipe it along the bottom of your lip line, or use a teeny concealer brush with a flat edge. She recommends the Stila Perfectly Poreless Putty Perfector, $39. 5. At first, I felt hyperaware of my every move and gesture. My first day in red lipstick was spent overcompensating for my self-consciousness: eating carefully, drinking with a straw, keeping exactly three Q-tips handy to fix any smudges. Many women’s first experiences I’ve read about wearing red lipstick described this “imposter syndrome” or an overwhelming sensation of feeling like a fraud and being afraid of being called out for it. I wasn’t immune to it. The first few days, I couldn’t have been happier to go home and wipe everything off. 6. Keep Q-tips handy for midday touch-ups. A pointed cotton swab was key for touching up any smudges or lipstick bleeding. I really like cotton swabs because they’re so easy to throw in your (makeup) bag. I liked combining the rounded Q-tips Cotton Swabs, $5, with these pointed Q-Tips Precision Tips, $8, depending on how much product I needed to wipe away. 7. Lip liner and a lip brush can help you get a more precise red lip. © Photographer: Cristina Cianci, Graphics: Morgan Johnson Buy it: Fresh’s Advanced Therapy Sugar Lip Treatment, $26, and Chanel Rouge Allure Liquid Powder in Radical, $30. I was familiar using the lip liner, which can help you outline the edges of your lips and help keep your lipstick from bleeding. But I learned that a lip brush is a secret weapon experts like Giglio keep in their makeup bags to create a sharply defined lip. “Lip brushes are smaller, tapered and flat, and you can use the different edges to achieve that lay of product,” she explains. So, instead of putting lipstick directly onto your lips, wipe a lip brush on the bullet, then use it to apply the lipstick on your lips. The real aha moment came when she said to tilt my head up while looking in the mirror next time to get a better view of the contours when applying (as opposed to looking head-on the whole time). It’s such a simple little trick that really helped me nail coloring within the lines. The lip liner I used throughout the week was the MAKE UP FOR EVER Artist Color Pencil: Eye, Lip & Brow Pencil, $18, and the lip brush was the Sephora Collection PRO Angled Lip #84, $15. 8. Different reds may work better for different skin tones. I’d like to think I have quite the tasteful eye when it comes to discerning shades of the same color: I own over a dozen red nail polishes that my boyfriend thinks look exactly the same but anyone who knows anything about red knows that there’s a distinct difference between Essie’s A-List and Russian Roulette. Giglio taught me that the best way to decide which lipstick shade is best for you is to check your undertones and the tone of the lipstick: Cooler, blue-based reds work better on fair skin (they also help your teeth look whiter) and yellow-based tones are more flattering for warmer skin. “Hold the shade next to your lips as if you were trying on a dress and that’ll give you a good indication whether or not the color will suit you,” she tells SELF. 9. Strangers might be nicer to you. Can I just put it out there that total strangers are so much nicer when you wear red lipstick? I forgot my subway card at home and a stranger gave me his round-trip fare. Was it because he knew how much effort I put into my lipstick this morning and on some level felt sympathetic? Or did he have secret powers that sensed I was writing a story and needed some good material? Or, as the cynic in me wonders, is it just that I was a young woman in red lipstick and that makes guys do things for you? Whatever it is, I’ll take it! 10. Red lipstick makes you feel all kinds of things about yourself and your place in the world. © Photographer: Cristina Cianci, Graphics: Morgan Johnson Buy it: Dr. Bronner's Organic Lip Balm Peppermint, $3, SEPHORA COLLECTION PRO Lip Brush #85, $16, and Decorté The Rouge High-Gloss Lipstick in RD453, $35. I like to keep my beauty looks natural for the most part, which means no foundation and a coat or two of mascara—so I found that a red lip was a surprisingly “easy” way to feel more put together. I mostly kept my hair down, but sometimes would tie it in a low bun. Although red lipstick made me feel acutely more aware of my own presence, it also made me feel more confident and mature, like the woman I wanted to be. 11. Be careful about how you take off your clothes unless you want lipstick stains everywhere. 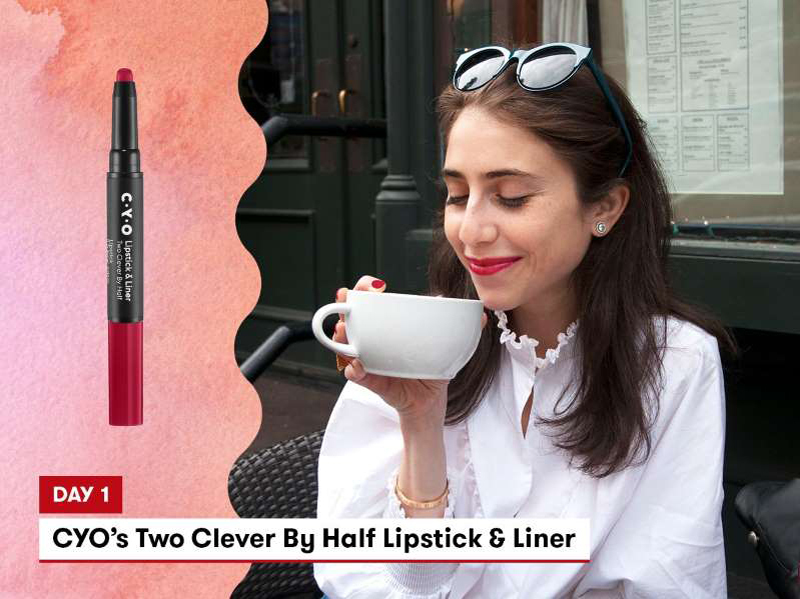 You’d be surprised how easily red lipstick transfers onto things like mugs, paper cups, clothes, and well, people too. I was. One thing I was constantly paying attention to is what my lips were touching. I found it easier putting on my clothes before applying lipstick in the morning, and then taking off my lipstick before removing my clothes at night. And unless your significant other doesn’t mind red-stained lips, save the kissing for later. 12. A red lip is basically part of your outfit. 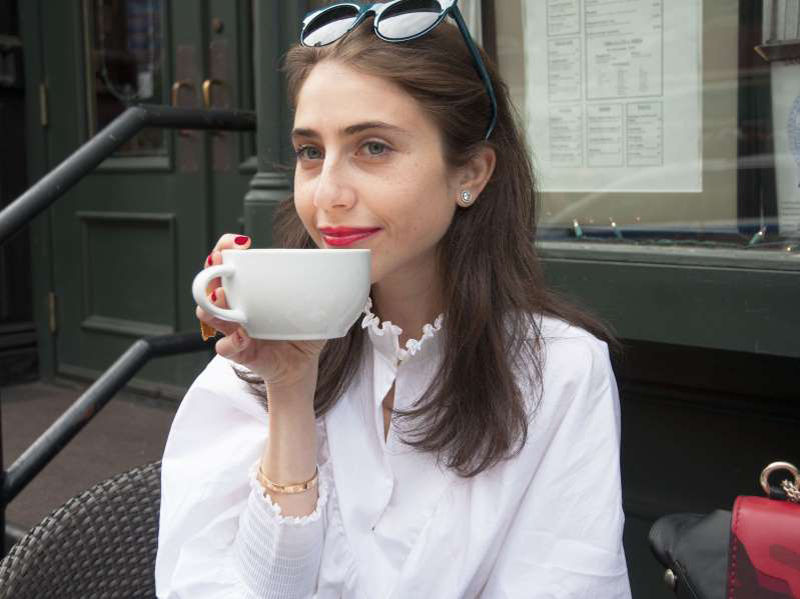 All the things I’d heard about red lipstick making you feel more put together were undeniably true: I felt just as confident and lively in a printed silk blouse as a fluffy shearling coat or an oversized sweater. 13. In the cheesiest way imaginable, red lipstick made me feel invincible. © Photographer: Cristina Cianci, Graphics: Morgan Johnson Buy it: Kopari’s Coconut Lip Glossy, $12, and Dior’s Rouge Dior Ultra Rouge Lipstick, $37. One day, toward the middle of my experiment, I caught myself smiling a little wider and walking a little taller (I am 5-foot-1, every little bit helps!). I had this subtle sense that something had changed. I know that red lipstick is not going to alter the world in any significant way (although maybe it should? ), but the boost of confidence I got while sporting a red lip—and realizing that no one was obsessing about it but me—was powerfully comforting. Oh, and weeks later, I’m still wearing it.